Paseo Heights is 30-storey residential condominium that features refined taste and modern comforts and conveniences. This location will allow for stress-free, luxury living at affordable prices. The residential condominium is located near retail establishments in Salcedo Valley and Greenbelt District. On the 7th level of the development, residents can enjoy a private playground and amenities for relaxation and rejuvenation. There is a lap pool for residents as well as a function room that is available for residents that want to host their own get-together. Typical Residence features include: entrance panel door with viewer, individual electric and water meter, provision telephone and CATV lines for each unit, provision hot and cold water lines for each unit, kitchen with modular under counter and overhead cabinets, ceramic plank floors for the bedrooms, ceramic tiles for living, dining, toilet and bath, kitchen and sleeping den areas, individual mailboxes with key and an individual Condominium Certificate of Title. The units that are available include: Studio 1 measuring 30 square meters, Studio 2 measuring 33.6 square meters, Two Bedroom 1 measuring 62 square meters, Two Bedroom 2 measuring 90 square meters and Two Bedroom 3 measuring 95 square meters. 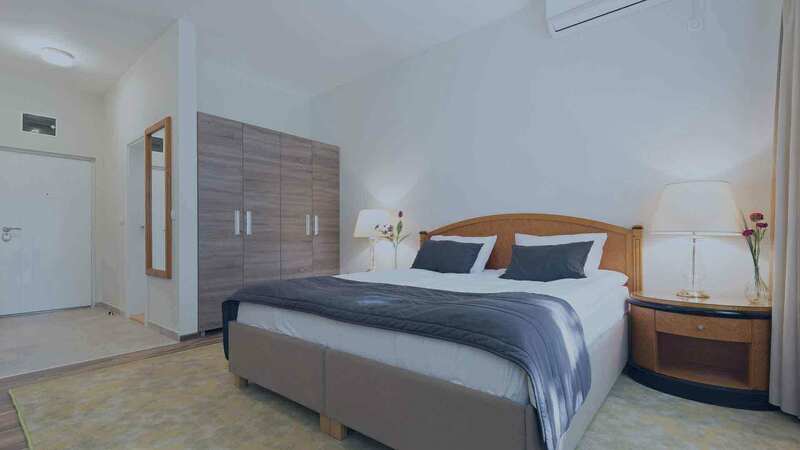 All units are pre-furnished with split-type-air-conditioning unit (s), cook top and range hood, washing machine/dryer, microwave oven and 12 cubic foot refrigerator. The development offers residents amenities such as: a 15 meter lap pool, an in-pool water lounge, outdoor lounge on a wooden deck, kiddy/wading pool, Laundromat, fitness center, function room with spill over, changing and shower rooms and an outdoor shower area. The ground floor of the condominium development features a main lobby with reception counter and lounge area, three high-speed, interior furnished passenger elevators, security command for 24-hour monitoring, centralized mailroom, retail spaces and closed circuit TV for monitoring of selected areas. the building features automatic smoke and heat detection with fire sprinklers for all units, overhead tank and underground cistern for ample water supply and a standby power generator for selected common areas. This residential condominium will be constructed by Megaworld International and is expected to be completed in the year of 2017. Shopping is one part of the human life that cannot simply be compromised and as such, the location of Paseo Heights answers to your demand with a supply of a variety of adventure to pick from. The King of Travel is about 200 meters from your doorstep as so is The Tambunting. Further away are The Shelter, Wilhemsen’s Shipping and Toto all to your convenience. To be far from the city’s great restaurants would be a crime against good taste. Hussein’s restaurant provides a good sense of exotic meals. Bugys Food Place is only a stroll away as so is Apartment 1B, La Cuisine Francaise for a French experience and Terry’s Selection. With all on the same street, the temptation to pop into each to get a bite is almost irresistible. School lies in the class of top education institutions and your children will be happy at any. Imagine driving a toddler for over an hour with the stresses of city traffic? Apple Seed Montessori, Playworks School, Ateneo Professional Schools, Spurgeon School Foundation just to mention a few, all come as good choices distance and other factors considered. Lyceum of the Philippines College of Law joins the University belt and a long list of senior schools such as Ateneo Graduate school of Business and Manua Institute of Technology. Your health should be in safe hands with a choice of top art medical institutions equipped with technology and capable human resources. Beverly Hills Medical Group, a pediatric specialist hospital for your little ones, Fortmed Medical Clinic, Supercare Medical Services, Barangay BelAir Health Office all serve to your wellbeing. The central business district is just but a few bends away so transport and commuter services should not be any trouble. You can choose to ride to town or even take a walk and still keep time. Close proximity to the central business district of Makati means that you can stroll to work or any errands you have to run in town. Safety first appears to have been the running call in the construction of the tower. Every unit, chamber or corridor is fitted with automatic fire and smoke detectors coupled with fire sprinklers and 2 emergency exits per floor. The tower has its own source of clean water as well as sewer system. An underground cistern that pumps water to overhead tanks is complimented by an underground septic tank connected to the city’s sewerage systems. Individual mail boxes are provided hence little need for post office visits as you get to receive and send mails from the convenience of your home. The interior of the units is designed artistically with ceramic planks and tiles hand crafted into spectacular curves and edges. The units are further made to be self-contained with cabinets and fittings as well as air conditioning units. Ample parking is provided with each slot having a reserve or two depending on capacity and location in the building and is regulated using radio frequency identification imprinted on a digital access card accessible remotely. The parking is also fitted with an annunciator panel with speakers. With growing security concerns, access to the building is regulated using key cards with user information imprinted into a chip. Close circuit television is used to monitor all social places and the security office is open round the clock. Movement up and down the tower is facilitated by 3 furnished high speed elevators. On the ground floor, a reception lobby attended to by trained public relations officers will serve to better communication between residents and management. Every unit is fitted with telephone and wireless fidelity facilities for communication within and without the building, multipoint water heater at all washrooms, individual electric and water meters to keep tabs on your bills as well as standby power generators. Changing rooms are provided at public places for male and female users alike. You will be impressed by the 15 meter lap pool with a shallow and deep end coupled with a kid’s pool for your little ones to wade and feel the moment complimented by sundecks and a waterside lounge. The fitness center is well placed on the seventh floor with gym, spa, sauna, yoga and martial arts centers attended to by well trained and qualified professionals. The lawn on the outside is regularly maintained and fitted with wooden benches in what is to be an outdoor lounge for those moments that would be poorly enjoyed when placed indoors. Laundry and housekeeping services are available on call at a reasonable fee. Management of Megaworld Properties always assigns in house agents to attend to matters of concern, even after the purchase has been made therefore worry not about any challenge. Plan 1: Cash in 30 days from the date of reservation with a discount allowance of 20%. Plan 2: 30% down payment with discount allowance of 10%, 40% payable in 48 monthly installments from the date of reservation and the remainder 30% payable via bank finance. Plan 3: 15% down payment with 10% discount allowance, 60% payable in 48 monthly installments from the date of reservation and the remainder 25% payable via bank finance. Plan 4: Cash deposit of 75% with discount of 10% and the remainder 25% payable via bank finance. All 30 floors of the condominium add up to 500 residential units. Buyers get to choose from between studio units and one bedroom units. The studio units come in two provisions; with a balcony and without a balcony as so do the one bedroom units. All units however, come fully furnished. Price ranges between 5.7 and 10.8 million PHP as of the last quarter of 2017 the variation arising from difference in space. Quality and safety standards are a priority for the reputation of any developer hence Megaworld Properties look to constantly reassure their buyer by scheduled inspections on the property and upon request by a resident. In the world we are living in today, negativity seems to be just everywhere you turn. Somehow, despite all our best efforts to stay optimistic and be happy of what we encounter daily, pessimism seem to somehow find its way through our hearts and minds, because of this every day of our lives seem to become a struggle. This struggle of ours seem to always pull us down and make us feel mad and bitter about the world. Somehow we tend to feel the helplessness of this apathetic world. However, despite every single thread of negativity we acquire from being outside, we still push to go through the struggle. We still continue to fight and the reason behind you continuing the fight is because you are fighting for someone. You are fighting this world of negativity because you see that there is still positivity in it. More than that, you fight because you are not the only fighting for yourself. You are fighting for that word called family. That family that cares for you, that family that accepts you and that family that will always be there for you despite all the downsides. You fight for them because in the end, if riches are all lost, they will continue being your one and only treasure. With all these said and heard, Megaworld, one of the country’s leading in real estate, gives you an opportunity to give back to the family you have always gotten your energy and strength from. Megaworld gives you an opportunity to give your family the best of life in order to make your struggles and theirs much more bearable and much easier to handle. That is the reason why Megaworld gives you, Paseo Heights, the urban haven in the heart of Makati created as a sanctuary not just for you but also your family. Paseo Heights by Megaworld is a 30—storey residential condominium created to be your very own private sanctuary in the city where you and your family can get away from all the negativity and the hassle of the outside world. It sits in a prime location, in the middle of the ever-busy Makati City where ironically Paseo Heights gives you comfort and serenity while being also in the rush of urbanity. Seeing that each and every family has their own living space needs, be assured to know that with Paseo Heights, you have the power to choose from varied living spaces that will cater to you and your family’s living space needs. Because your very own Paseo Heights unit becomes you very own urban getaway without leaving the city, Paseo Heights created by Megaworld offers you the following space options for your very own private refuge, choose from: studio units measuring 30 square meters and 33.6 square meters, two-bedroom units measuring 62 square meters, 90 square meters and, 95 square meters. Know that this wonderful sanctuary will be finished this year, this gives you an opportunity to hastily grab the chance to have this one-of-a-kind opportunity to provide the best possible sanctum for you and your family. Because in the end of the day, despite all your struggles, you continue because you just want to provide the best for your family. This is the main reason why you should grab a Paseo Heights unit as soon as you can. Megaworld Paseo Heights in Salcedo Village, Makati City, Philippines is a premier Condo project available for sale. If you're looking to rent or purchase Paseo Heights, then check here first. We have full details of Paseo Heights updated regularly as well as everything you need to know about the availing and booking process, broken down into stages that includes selecting a unit, choosing a payment plan and buying your dream home at the right price. For price list, free site tripping or showroom visit, personalized service, model house, unit plans, floor plans, payment terms, CHAT LIVE with an agent 24x7. We are Remax Perfect Homes. Always only buy from PRC licensed Real Estate Brokers and Agents. The Megaworld Paseo Heights Salcedo Village is only 3 street blocks away from the Royal Embassy of Saudi Arabia and just a block away from the Ateneo de Manila University Makati. This condo in Makati is also a few meters from Paseo de Roxas, the Vicente Madrigal Building, Ayala Avenue, Jaime Velasquez Park, Makati Sports Club, Zoobic Zafari Corporation, Mapua Institute of Technology, Ateneo Graduate School of Business, Salcedo Saturday Market, the Department of Tourism Office, Ayala Triangle Gardens, the SGV and Co., Italian Embassy, Spanish Embassy, Royal Thai Embassy, Indonesian Embassy, Kuwait Embassy, Makati Medical Center, the Jewish Association of the Philippines, and other of Makati’s well-known landmarks. This strategic location just makes the Paseo Heights Salcedo Village a very precious residential condo community this side of Makati. Despite the Megaworld Paseo Heights’ location, having a world-class amenities, a very high lifestyle status, and has the most innovative residential units throughout the land, this well-entrenched community development is still reasonably price compared to other high-end residential development in the Makati area. Have the chance-of-a-lifetime of owning a piece of the Paseo in just easy terms that really fits your budget. Set in the elite neighborhood of Salcedo Village, this condo in Makati is built within a sight of the Jaime Velasquez Park (aka Salcedo Park) located across Paseo Heights. The park is the only remaining green, landscaped, and public park in Makati. The park has children’s playground, benches, and small retail shops that surround the park. This park is a common space for many children, their parents, and nannies living in the high rise towers of the city. The park serves also as a place where children can simply roam free and play with other children in the neighborhood. For some who grew up in this area, the Jaime Velasquez Park has a special place for lots of fun memories. Reminisce your childhood days while you live nearby. The Megaworld Paseo Heights residential units are currently filled with important home furnishings, appliances, and deliverables when you move in. These include microwave oven, washing machine with dryer, kitchen countertop with stainless steel sink, air conditioning unit for every bedroom, entrance wood panel door with viewer, complete bathroom fixtures, kitchen with modular undercounter and overhead cabinets, provision for CATV and phone lines, provision for hot and cold water line for shower, multi-point water heater in all T&B, ceramic plank for bedroom; ceramic tiles for living, dining, kitchen, and bathroom areas; individual mailboxes with keys, and other worthy deliverables.